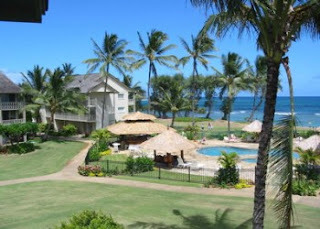 Aloha and welcome to our top floor, stunning ocean view condo studio on the beach in Kauai. The picture you see here of the ocean and pool is exactly what you get when you stand on the lanai of this beautiful condo. We manage our condo ourselves and can get you the best rates because you are renting directly from the owners. Islander on the Beach is on six lush acres of ocean front property and the entire complex and pool area were completely renovated in 2005. For an affordable price, you get a beachfront property, ocean view studio condo that is conveniently located centrally on the eastern coast of Kauai. Please read our guest comments on our website. We would love to have you as guests in this beautiful condo.